Are graphical menus a make-or-break feature for you? It's not so much an issue for me, but I would like to invite mates over who have only played quake 2 and 3 who don't know a lot about linux. 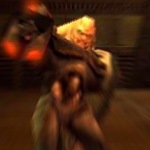 I think in the interest of getting new players into quake2world and really enjoying its awesome gameplay, we definitely need to implement some kind of menu system even if it is only enough to start a server or connect to a game. I am too surprised with the vote turn-out. A good guide to the console would be adequite for most, the key is a guide to show people how to use the console if it is foreign to them. Wow, I didn't expect something like this.